Backreaction: Dear Dr B: Why are neutrinos evidence for physics beyond the standard model? Dear Dr B: Why are neutrinos evidence for physics beyond the standard model? The standard model of particle physics contains two different types of particles. There are the fermions, which make up matter, and the gauge-bosons which mediate interactions between the fermions and, in some cases, among themselves. There is one additional particle – the Higgs-boson – which is needed to give masses to both bosons and fermions. Neutrino event at the IceCube Observatory in Antarctica. The fermions come in left-handed and right-handed versions which are mirror-images of each other. In what I think is the most perplexing feature of the standard model, the left-handed and right-handed versions of fermions behave differently. 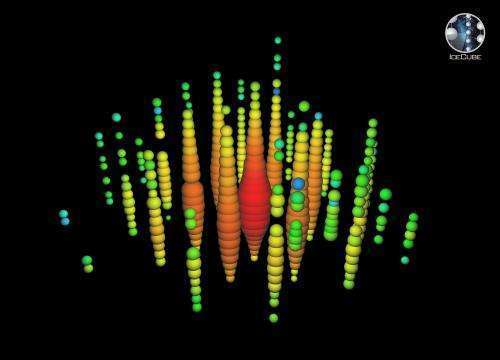 We say the fermions are “chiral.” The difference between the left- and right-handed particles is most apparent if you look at neutrinos: Nobody has ever seen a right-handed neutrino. You could say, well, no problem, let’s just get rid of the right-handed neutrinos. Who needs those anyway? But it’s not that easy because we have known for 20 years or so that neutrinos have masses. We know this because we see them mix or “oscillate” into each other, and such an oscillation requires a non-vanishing mass-difference. This means not all the neutrino-masses can be zero. Neutrino masses are a complication because the usual way to give masses to fermions is to couple the left-handed version with the right-handed version and with the Higgs. So what do you do if you have no right-handed neutrinos and yet neutrinos are massive? The current status is therefore that either a) there are right-handed neutrinos but we haven’t yet seen them, or b) neutrinos are different from the other fermions and can get masses in a different way. In either case, the standard model is incomplete. It is partly an issue of terminology though. Some physicists say right-handed neutrinos are part of the standard model. In this case they aren’t “beyond the standard model” but instead their discovery is pending. I have a personal fascination with neutrinos because I believe they’ll be key to understanding the pattern of particle-masses. This is because the right-handed neutrino is the only particle in the standard model that doesn’t carry gauge-charges (or they are all zero, respectively). It seems to me that this should be the reason for it either being very heavy or not being there at all. But that’s speculation. In any case, there many neutrino experiments presently under way to closer study neutrino-oscillations and also to look for “neutrinoless double-beta decay.” The relevance of the latter is that such a decay is possible only if neutrinos are different from the other fermions of the standard model, so that no additional particles are needed to create neutrino masses. So, no, particle physics isn’t dead and over, it’s still full with discoveries waiting to happen! What are the chances of the universe ending out of nowhere due to vacuum decay? Why do physicists worry so much about the black hole information paradox? Where does dark energy come from and what’s it made of? What do physicists mean by “quantum gravity”? How come we never hear of a force that the Higgs boson carries? Why is Lorentz-invariance in conflict with discreteness? or click here for all posts in this series. I'm a little confused. If they're massive, then they go slower than c. So shouldn't we be able to overtake them and see them from the other side, where they'd be right-handed? I suppose we don't have much opportunity to slow them down. Looking at a particle from the other side doesn't make a left-handed particle right-handed. You can look at your right hand either which way, it'll still be your right hand. I think that Allen is referring to the helicity of neutrinos in his comment, which is indeed depending from the reference frame in which we look at them, if they're massive. But heliciy and chirality (i.e. being left-handed or right-handed) are exactly the same thing only for massless particles, so the trick wouldn't do with neutrinos, for which the two concepts are only approximately coincident and only chirality is an intrinsic property. That was an interesting question and also an interesting answer. Neutrinos might be the key to a lot of cosmological mysteries. Thanks Dr. H.
To clear up Allen's comment. Left or right handed is defined by the direction of rotation and direction of motion of a particle. So if you have a left handed neutrino and you can move faster than the neutrino, the neutrino would look like it is moving in the other direction, while the direction of the rotation hasn't changed. Therefore, in your new moving frame, the neutrino is now right handed. The way to avoid right handed neutrino in the standard model is to assume that the "left handed" neutrinos are actually Majorana fermions. Majorana fermions have half the degrees of freedom of Dirac fermions, but they do not have a defined handedness, so it is misleading to call them left handed. Just wondering, are there examples of consistent qft with particle that has all zero charges? Are such particles funky in some way in general? The Higgs does not confer mass upon hadrons (within a few percent). Geometric chirality is absolute for translations and rotations. Helicity is observer-dependent. The free-space Green's function for Laplace's equation in three variables, Cartesian x = (x,y,z), arises from the reciprocal distance between two points (Newtonian potential). Squaring the difference of each coordinate axis removes geometric chirality from the vacuum. An Einstein-Cartan trace chiral anisotropic vacuum background creates observed chiral divergences. Test for it in existing bench top apparatus. Look! The worst it can do is succeed. Please see Nacho's comment which gets it right. Nacho's statement is correct, but saying that "chirality is an intrinsic property" is a bit confusing, at least for me. Chirality is an intrinsic property of the fields in the standard model. Yet you cannot look at a massive electron and measure its chirality, because it doesn't have a well defined chirality. The mass term mixes the left and right hand fields. Only when the momentum is much larger than the particle mass, we can ignore the mass term and treat the particle as a massless particle with a well defined chirality. I went to a lecture at the Perimeter Institute by Physics Nobel winner Art McDonald, and it was opened by a few words by Niel Turok. The subject was, of course, the SNO observatory (where I did my Ph.D.). I was kinda surprised when Niel talked about massive neutrinos being part of the standard model. Art gave him quite the look when he said that. https://www.youtube.com/watch?v=hLp15co2D-A at the 3-minute mark and then at just after 5m:20s mark. It kinda sums up what the Standard Model is to a lot of physicists, its 'Embrace Extend Extinguish' - if it is real it's in the SM. Hence its very hard to go 'beyond the Standard Model', as it just subsumes all accepted theories. Like many successful theories, the SM now contains enough variables and extensions that it can cover just about any discovery in particle physics. The thing is that many extensions are rather trivial and don't change the core of the Standard model. They are doomed to be called "Standard model with...". And as time passes the "with..." part is doomed to be forgotten. On the phenomenological level of the effective field theories both Dirac and Majorana neutrino masses are very simple modifications. However it also the same with renormalizable models. 2). Standard model plus the seesaw mechanism with the right neutrino being decoupled from everything else. All that remains to be determined about the neutrinos is the final link in the mass ratios, as I recall. What will that tell us? Elegantly spare maths require gravitation and particle physics postulate achiral isotropic vacuum. Derivation defines experiment. Parts-per-billion left-handed chiral anisotropic vacuum selective to hadrons is horsefeathers versus unending chiral curve fittings to observation. Eight single crystal quartz marbles, four each in enantiomorphic space groups P3(1)21 and P3(2)21, are perfectly geometrically chiral self-similar solids (DOI: 10.1002/hlca.200390109, 10.1107/S0108767303004161) with chiral emergence volume 0.113 nm³, 12.557 Å³/atom. gamma-Glycine in P3(1) and P3(2), 0.234 nm³, 7.815 Å³/atom. Test spacetime geometry with geometry - Eötvös experiments observing maximally geometrically chiral opposite shoes embedded in a trace vacuum left foot pursuing non-identical minimum action trajectories. Pegasus. If I follow correctly, the right handed neutrino should be there, and it could have mass but we cannot find it. There is also dark matter postulated which, since it does not bulk up, may well be a fermion, but we can't find that either. Could they both be the same? While we still can't find them, at least there is some evidence that dark matter could exist, and there is something physical that we cannot explain properly. Yes, that right-handed neutrinos might make up dark matter is a long-standing proposal which is still pursued by some people. @Ian Miller Spiral galaxies rotate as a unit to large radii (Tully-Fisher relation). Required mass distribution is filled spherical, curve-fitted by undetectable dark matter. 1.2×10^(-10) m/s² Milgrom acceleration also fits Tully-Fisher. Noether's theorems plus achiral isotropic vacuum conserve angular momentum. Baryogenesis, 6.1×10^(-10) bias matter versus antimatter, requires trace chiral anisotropic vacuum (Sakharov conditions). Sakharov causes Noetherian conservation leakage, Milgrom acceleration! Part-per-billion vacuum mirror asymmetry de-parameterizes non-classical gravitation and particle theory. Trace chiral anisotropic vacuum violates accepted theory it attempts to falsify. Testing for it (posts above) is unfundable. If you deep sea or ballistic navigate, do you parameterize Euclid or embrace Bolyai? It seems like Nature delivers some messages through Neutrinos and Weak forces. If we can decipher what nature tries to tell us with these messages, then we may discover the long-sought new Physics. "Spiral galaxies rotate as a unit to large radii (Tully-Fisher relation)." Not as most people understand the term. The rotation curve is flat, meaning that the velocity is the same at all distances from the centre, but a galaxy doesn't rotate like a rigid body, where the angular velocity would be the same at all distances from the centre (and the velocity would increase with distance from the centre). @Phillip Helbig "8^>) L = rmv, constant physical not angular velocity is constant versus radius. Dark matter is undetectable as such, and undetected in deep cryogenic neutrinoless double beta-decay, bismuth alpha-decay half-life (DOI:10.1038/nature01541); and in kinetic neutrino detectors. Geometric tests of spacetime geometry are chemistry-obvious but physics-excluded. Geometric Eötvös experiments have zero free parameters in exhaustively qualified apparatus. Single crystal quartz is grown to parts-per-billion chemical purity and near zero dislocations/cm² structural perfection as +X-region waveplate, obtainable in 40 mm x, 90 mm y, 110 mm z dimensions. Pioneer anomaly to OPERA superluminal neutrinos, theory alone is both inexhaustible and insufficient. Look. Apparently you try to confuse me, since left-handedness vs. right-handedness should be defined according to helicity (not chirality) here. Otherwise lack of chirality-wise right-handed neutrinos would be the same issue as such a lack for the other leptons too. The other leptons can get quite slow, thus their helicity can revert. Just the neutrinos are commonly such fast that their helicity is (according to any measurement so far) the same as their chirality. Thus we suffer a lack of slow-moving neutrinos where we would see their helicity reversal. And a (reasonably) heavy neutrino would naturally provide a neutrino structure that could be slowed down (for the helicity reversal). I don't know who your comment is addressed to but please note that I never even used the word chirality. @m-artins Geometric chirality is a static property requiring at least N+1 points in N dimensions and an emergence volume or length (e.g., screw pitch). Geometric chiral divergence can be calculated but not measured. DOI:10.1063/1.1484559 Chiroptical properties are quantitatively arbitrary. 11 pairs of periodic crystal enantiomorphic space groups in 230 total are perfectly chiral mass distributions. Three pairs of P3xxx therein contain no counter-chiral paths. P3(1,2)12 crystals are often misassigned (e.g., CrCl3). That is math and chemistry. Physics looks elsewhere. Only relativistic helicity is chiral, a particle whose energy is at least equal to its rest mass (thermal energy 3kT/2 greater than mc²). Attempts to source biological homochirality via beta-decay or circularly polarized UV light selective decomposition were not substantive. Room temperature is about 0.026 eV. Sourcing "slow" neutrinos, other than primordial neutrinos, is unlikely. Primordial neutrinos are around 1.95 K, having decoupled earlier in the universe than photons. Total density is 340/cm³ - vastly undetectable. DOI:10.1051/0004-6361/201525830. All other approaches are also well below 4. 1) The problem of right-handed neutrinos is indeed related to chirality, not helicity (please check the abstract at https://arxiv.org/abs/1303.6912). 2)Just looking at the theory, before going to the lab, the Dirac mass term for a lepton in the Lagrangian can be decomposed using the chirality projectors (the ones with the gamma5) acting on the Dirac spinors. In fact, that's why we have trouble with the right-handed neutrinos: if they don't exist we cannot even construct a Dirac mass term, and we need to look for other solutions, since we expect them to have mass. 3)When we project onto the chirality eigenstates, we end up in one of the irreducible representations of the Lorentz group: we get the so-called Weyl spinors. Since these are irreducible representations, acting on a left-handed neutrino with a Lorentz transformation would always give a left-handed neutrino, and similarly for a right-handed one. In other words: when considering chirality, left-handed and right-handed states never mix under Lorentz transformations. That's what I mean when I say that chirality is an "intrinsic property", and what I thought Sabine meant with the hand example in response to Allen. 4)So, if we start with a left-handed neutrino (in the chirality sense) and move to no matter which frame of reference (i.e. act with a Lorentz transformation), there's no way we can see a right-handed one. We can only turn a negative-helicity (left-handed)neutrino into a positive-helicity (left-handed)one; this is of course very difficult since neutrinos are very fast. But as in 1) we are interested in chirality, and for massive particles (like neutrinos) chirality and helicity are two different concepts. AFAIK experiments only show that we deal with neutrinos of left-handed helicity. The old/wrong assumption of massless neutrinos had lead to assumption of left-only chirality of the seen neutrinos (It only is consequence if neutrinos are massless, otherwise it is an assumption by itself). Keeping a wrong assumption can obviously lead to (pseudo)paradoxes. PS I've seen an amount of plain wrong abstracts, even such ones that were stating stuff contrary to the data presented inside those articles (since the authors were trying to promote their pet theories). Re m-artins' comment - I have seen papers that actually make statements in their papers that contradict their own data. Unfortunately referees seem reluctant to do their job with "big names", and often with smaller ones.